Pop from popular and Alu from aluminum construction, two terms that so far have been considered incompatible, but that this design aims to concile. The Pop Alu 32 design brings the safety and longevity of an aluminum hull to a size range that has surprisingly few designs availbale for the amateur or small boatyard builder. And furthermore this design seeks to transform the building process in an efficient operation that will lead to a finished boat in record time at reasonable costs. With a 8mm ( 5/16”) thick hull and the twin bulb keels and rudders that allow shallow draught freedom, the Pop Alu 32 enphasizes safety and accessibility, both in navigation and maintenance chores. Thick shell plating allows for better and easier welding and a minimal internal structure, offering the builder great savings in material and labor costs. The boat can rest on the twin keels when the tide goes low or when on a hardstand, and with only 1.28m ( 4’ 2”) draught can reach storm heavens and cruising grounds out of reach from more conventional boats of the same size. Being able to dry out on a low tide, the maintenance below the waterline can be done at minimal costs. A Delta hull form brings cutting edge design trends into the design and vertical topsides make the boat easy to build while keeping the forms easy on the eye. A panoramic view from inside the cabin is another feature that adds to the quality of life and safety on board, allowing ample ventilation and natural light to enter the boat. The interior arrangement is generous for a 32 footer. Bunks 2 meters (6’ 7”) long and saloon setees as well, a head with good foot room and a nav station table that can become an office, with 1.10 x 0.55 meters ( 43” x 22”) and a L shaped galley with lots of countertop space. Coming down from the companionway hatch there is the galley to port and nav station to starboard. To the stern there is a double cabin to port and the head to starboard. The saloon has drop down tables big enough for a good dinner with guests and forward there is spacious double bunk with ample shelving. 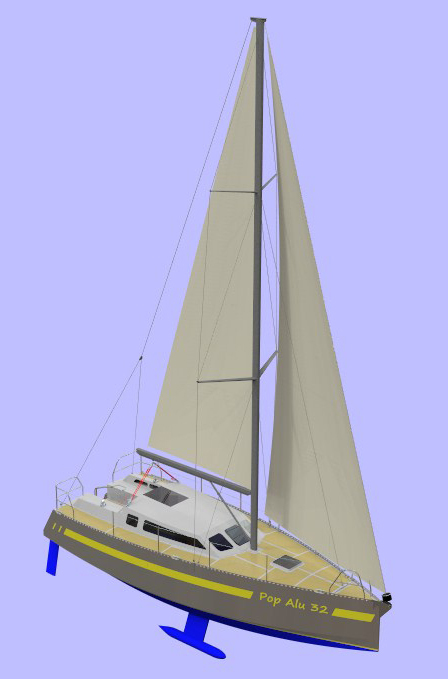 All this features compare in size to bigger boats due to the beam carried aft characteristic of this type of hulls.Accessed from the cockpit there is a large lazarette that can accommodate lots of gear and holds the main fuel tank. A large chain locker holds enough ground tackle to cope with demanding anchoring situations. The sail plan can be tailored to the navigation program. For coastal work the standard option is a masthead rig with small overlap and a removable inner forestay for setting a storm jib or heavy weather jib. A removable bowsprit takes care of lighter and reaching conditions. For continued offhsore work a permanent roller furling system can be installed instead of the removable stay, creating a versatile sail plan ready for lots of options. The Pop Alu 32 is fitted with twin bulb keels, designed with simplicity of construction in mind. Leading and traling edges are from machined solid alluminum alloy rod, and flat or single curvature plates are all what is required in addition to the lead ballast. Each keel weighs a little more than 600 kg (1320 lb), which helps handling them during construction. The rudders are two, transom hung and with a very simple and robust system. Reliability and easy maintenance are strong points here, and the rudder blades are protected by the bottom hull plate, which extends past them. Between the twin rudders there is a pivoting stern platform. A cutting file kit for CNC cutting of the whole aluminum structure is available optionaly, at an accessible cost, and a similar kit for the interior joinery plywwod parts can be sent as courtesy at no extra cost for the builders that require it. The Pop Alu 32 can be an efficient long range cruinsing platform, offering fast and safe passages while keeping runnign costs low. This modern design can bring latest thinking in performance orientated hulls into the cruising scene and add the strength of thick alluminum construction to it.